Liquid mercury poured into a dish. Mercury is a natural element (number 80 on the Periodic Table) named after the Roman god of trade, profit, and commerce. 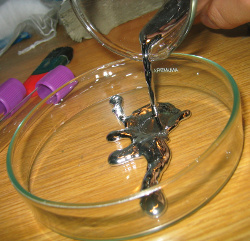 Under normal conditions, mercury is a shiny liquid metal. Itâ€™s known for its strange fluid movements; some you may recognize from scenes in Terminator 2 for the liquid metal T-1000. Mercury is commonly used in thermometers, barometers, fluorescent lamps, and batteries. Itâ€™s also been used as a coolant for nuclear reactors, a propellant for early ion engines, and in new types of atomic clocks. Ironically, mercury was believed to extend life and maintain good health by the ancient Chinese. Ancient Romans and Egyptians used it as a cosmetic, though it actually caused facial deformations. In truth, mercury is extremely toxic. Mercury poisoning can lead to damage to the central nervous system and kidneys.